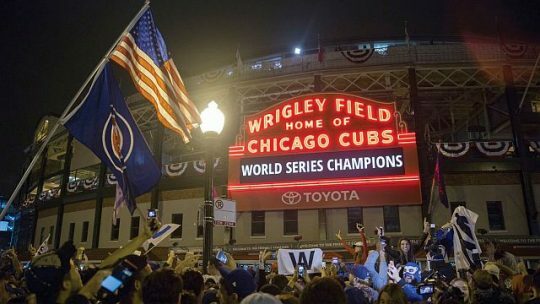 Certainly “Miracle,” a musical directed by Damon Kiely and premiering at the Royal George Theatre May 8, 2019, refers to the Chicago Cubs 2016 Championship. But during a phone interview with lead producer William “Billy” Marovitz, the concept’s originator, what comes across is how much baseball is a part of many people’s lives. And yes, Marovitz, who has followed baseball “for as long as I can remember,” is the former, long-time IL State Senator instrumental in working out the compromise that brought lights to Wrigley Field in 1988. Marovitz had earlier conceived a Chicago show about what happened in the city during the two Daley administrations. But when he realized the concept wasn’t going anywhere when Richard M. Daley didn’t run again, his love of baseball sparked another show idea. “It was Feb. 16, 2016 and I thought the Cubs have a good team. So I though let’s look at the season through a family. I needed to tell a story, not one just about baseball, but about real people, their ups and downs,” he said. The story, fleshed out by film and TV writer Jason Brett, co-founder of Chicago’s Apollo Theater, follows the Delaneys, a Wrigleyville bar-owning family, through changing times. Marovitz tells how in one part of the show the Delaney’s 11-year old daughter asks her grandfather who is always going over to Cubs’ park, how he got his limp.